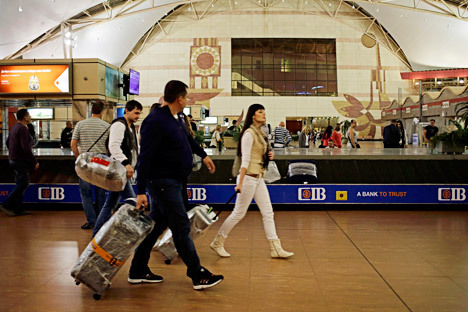 Russian tourists prepare to depart for St.Petersburg, Russia from Sharm el-Sheikh International Airport, south Sinai, Egypt, Thursday, Nov. 5, 2015. Egypt is among the most popular holiday destinations for Russian tourists. Since a terrorist attack is likely to be what caused the crash of the Metrojet Airbus on October 31, Egypt has now been declared out of bounds, after a flight ban was imposed in the wake of the deadly plane crash. The tourist industry may lose over $50 million, while observers predict a new wave of bankruptcies in the sector. Russian tourists are being transported home from Egypt after the deadly plane crash above the Sinai Peninsula on October. 31. Flights to Egypt have been suspended and fears are growing that the suspension of all flights from Russia to Egypt could have disastrous consequences for the Russian tourist industry. Russia suspended all flights to Egypt on November 6, amid rising international concern that the Kogalymavia flight from the Red Sea resort of Sharm el Sheikh to St. Petersburg, which mysteriously crashed just 23 minutes into the flight killing all 224 passengers and crew on board, was brought down by a bomb placed in the hold. An official cause for the disaster has, however, still not been established. The 80,000-odd Russians who are still in Egypt are being brought home in batches, separately from their luggage, which is being transported by Russian Emergencies Ministry aircraft. Rosturism (the Russian Federal Tourism Agency) figures suggest that Egypt is the most popular foreign destination for Russian tourists. In 2014, around 30 percent of all outbound visitors, or about 3 million people, visited Egypt, said Dmitry Gorin, vice-president of the Russian association of tour operators (ATOR). Tour operators say they are already losing money on the flights that are now going empty to Egypt, to bring Russian tourists back home. According to Anna Podgornaya from Pegas Turistik and Vladimir Vorobyev, president of Natali Tours, this means that they are losing half of the airfare on each empty seat. In other words, at an average price of a return ticket of $250, tour operators stand to lose a total of nearly $10 million. The situation is being further exacerbated by the losses from the cancelled flights. According to ATOR calculations, some 70,000 holidays in Egypt had already been sold for the period before New Year. At an average price of $800 per person, this will translate into losses of at least $56 million. Other potential losses include advance payments already made to Egyptian hotels. After last year’s wave of bankruptcies in the Russian tourist sector, advance payments were introduced by practically all hotels, said Podgornaya. Now tour operators will have to reach new deals with their local partners, promising the same level of tourist traffic once flights are resumed. After the start of the Arab Spring in January 2011, the Russian Foreign Ministry advised Russian tourists against traveling to Egypt and flights were suspended for two months. The tourist sector lost over $200 million as a result. The mass cancelation of trips to the most popular destination for Russian holidaymakers may mean bankruptcy for many tour operators, according to Irina Tyurina, press secretary of the Russian Tourist Industry Union. The only way out for them is to offer another destination to clients or persuade them to postpone their trip, she said. Alternative destinations could be Turkey, Cyprus and Asian resort destinations like Thailand. Some 20-30 percent of clients agree to a change of destination, Deputy Prime Minister Arkady Dvorkovich said on Nov. 7. Alongside an alternative destination, travel agents are inviting their clients to keep the money they have already paid for their holiday as a deposit, as it were: to postpone their holiday and book another one in December or after the New Year break (if it turns out to be more expensive than Egypt, the client will have to pay the difference; if cheaper, the tour operator will return the difference). It is not yet clear for how long the suspension of flights to Egypt will last. On Nov. 7, Dvorkovich said the ban will remain in place for at least several weeks, until an audit of security measures has been conducted and the necessary adjustments have been made. On Nov. 8, Prime Minister Dmitry Medvedev instructed the government to develop a program aimed at supporting tour operators. Based on materials published by RBC Daily, Vedomosti, and Kommersant.